The latest and greatest of iOS is now on your iPhone or iPad, and you are totally ready to take it out for a spin. But then you start experiencing problems with your lock screen or the widgets and notification feature. You swipe to the left from the home screen, and there’s supposed to be the widgets view. But the thing is that none of them populate with any data. Not News, Weather, not even Siri App Suggestions, and certainly not any third-party app widgets—just nothing! You discover that your widgets are not working or they fail to populate then start working again and then fail to fill-in yet once again–all for no apparent reason. What the heck? It’s so frustrating to find yourself in this place, we know. So here are some suggestion to help get your widgets up and running, so you get that test drive iOS experience! 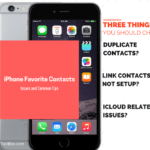 Getting the Most Out of Your iPhone Widgets! After downloading the latest iOS, the device starts, and we navigate to the widgets lock screen. But we discover that our widgets are completely blank…nothing..nada. Most of our widgets are blank, not anywhere near the content rich experience we see in the Apple Picture above. Our initial widgets search screen looked like this! Not good at all. If your weather widget is empty, please make sure that you have the location services turned on. Tap on your Settings > Privacy > Location Services . Turn on the toggle for location services. Without this, the weather widget does not show any information on your lock screen. If you have the News widget on your lock screen and it is showing up blank like the picture above, Go to Settings > Notifications. Choose to allow Notifications and Set the Show on Lock Screen to ON. If you are using News for the first time, make sure to open the app and choose your channels. This is another weird error that shows up on the iPhone while trying to open the News app. If you encounter this issue, your best bet is to sign out of your iCloud account. Open the news widget next and set it up as if it is a brand new account, then sign into your iCloud to complete. That should fix the issue. Your preferences and favorites get reset when you do this and for some reason, that fixes the issue. A strange but true tip that seems to work for a lot of folks is toggling on “Bold Text” in the Display & Brightness setting. Another oddball suggestion is to go to your regional settings and change your language and then change it back (I switch from U.S. English to Canadian English and back again). Go to Settings > General > Language & Region > iPhone Language and modify the language. This tip has worked each time to repopulate the widgets. Once you have explored the notification settings of the widgets, Press the home button and wake/sleep button for 10 seconds or so and let your iDevice restart. Restarting the device often fixes your widget content problem in iOS 10+. The introduction of iOS10 finally gave us iFolks the power to delete stock apps. So if none of the above steps worked for you, let’s give this one a whirl and remove and then reinstall. Performing this also deletes the widget so by reinstalling a current version of the app, we just might correct the widget issue. We recommend deleting the problematic app (and widget) and THEN restart the iDevice. Once restarted, open the App Store, look for the deleted app in your purchases and download/install the app again. After reinstalling and launching the app, check if the widget functions normally. Several readers report success with this method, particularly for faulty News app widgets. Add Widgets Quickly using 3D Touch! The iOS 10 design provides you with quick access to all your information without logging in and opening each of the apps. Your locked screen gives you a quick glance at your news, weather, emails, messages and other notifications. The default setting here does not require a passcode to access this information. 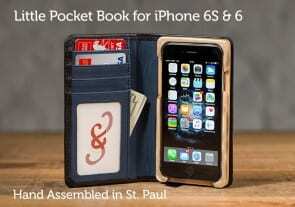 Anybody that has access to your iPhone or iPad can peek and glance at your private information. 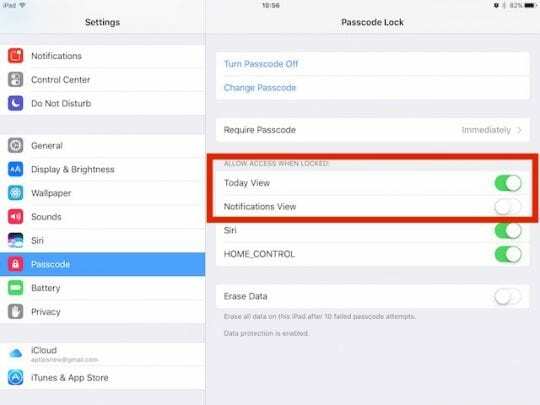 Here is how you can restrict access to your locked screen and all its widgets and make sure that your private information is not leaked via the widgets on your locked screen. If looking for a basic hands-on guide for iOS 10, check out this post! If you are looking for new widgets to check out, please take our post on the widgets search screen. 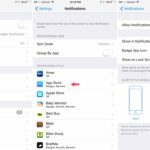 We have updated our master guide for all iOS 10 related troubleshooting. 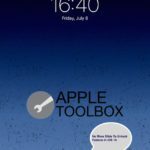 If you are having problems with installing iOS 10, or other app problems after installing iOS 10, Please check our step by step iOS 10 problem fixing guide. What’s your experience with iOS 10 so far? What features are you enjoying? What problems are frustrating you? Let us know in the comments below. I followed directions for making sure location was activated in settings; however my widget for the weather is stil not functioning. Thank you so much for the “A strange but true tip that seems to work for a lot of folks is toggling on “Bold Text” in the Display & Brightness setting.” it fixed my widget problem! The bold text toggle worked for me. So strange but thanks!! So try that first. All my widgets appear to be working on mi iPhone 6S and iPad mini 2 except for the news widget. I tried all the solutions offered in this thread but none of them worked to restore the news widget to show articles from the different news-agency’s I had originally selected. I was able to get the individual news-agency’s that had a widget to work without a problem. I suspect that the news widget has lost its channels that were originally selected. I haven’t found a way to go back to that initial screen where you selected the channels in the news widget. If someone can tell me how to reset the news widget back to its initial settings so I can reselect the channels I’d appreciate it. Ive tried deleting and reinstalling.. nothing works. The stock widget will display for a split second then unable to load.. Yes, that would be nice! But as of iOS 10.2.1, the option to toggle low power mode on or off is not yet a feature of the batteries widget. But here’s a quick way to get there since you have an iPhone 6S. Press firmly on Settings to open Quick Action Menu–Battery is one of the four options, tap that and it opens the Battery settings menu–and toggle on Low Power Mode. 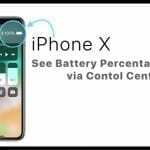 It would be really nice if the battery widget included toggling low power mode on in future iOS releases. AccuWeather app would only show “unable to load” in Today View”. I was dubious about the toggling-bold-text remedy; but tried it nevertheless. Lo and behold! As others my news widget is not working after upgrading to ios10. Who is going to give solution for this. All these solutions provided are of no help. Keep us posted if you find success or another method that works for you. Thanks for the comment; we love to learn and hear from all of you. Hey there . I tried resetting the device n other techniques but now no NEWS WIDGET is found . Earlier it was there and was working fine but after updating the device to 10.2 no NEWS WIDGET is found. Do you have the news app installed on your device? Check, if not re-install from the app store. then You can go to the widgets main screen (swiping right on your home screen), scroll down and tap on edit, pick the “+” green sign on the left of the news widget from the bottom and it will automatically move it into your widget display. it is also important to note that News is not available in all countries. I tried all these, but still face the problem of News Widget not loading stories. Its there in the edit widget option, but not showing anywhere in the settings – notifications menu, I guess, I am facing the same problem as that of friend Dhiraj has mentioned here. Weather widget is working fine. Only the news widget has the problem. Its not seen. My Weather widget shows locations but no weather information. I’ve checked location services and turned off and on again to .check but nothing?? Please help. Restarting worked for me! My notes app wasn’t updating in notifications when I was making changes to the notes. Glad it was so easy!! My problem is that when my iphone is locked, it shows just a part of new notifications. It only shows the app name, but nothing more… e.g. it shows that I recieved something in “messenger” but it does not show the name of the person who sent it and niether the text, that he wrote. And it’s like that with every app. I have a iphone 6 and am in India and before loading ios10 my news widget was working perfectly. However, of late and after loading ios10, the wnews widget is showing the message “could not load stories”. I have switched off and on my phone a number of times but no joy.Funnily, the news icon is not even appearing under “Notification”.Wonder if I am the only one with such a problem. This not helped to activate news widget. Still news not appearing. Has anyone found out how to fix the problem with reminders not working? IOS 10 needs an update for this asap! Come on apple! >My “The Weather Channel” widget constantly says, “cannot get weather data”. All other widgets are working and I’ve checked all the privacy areas so that it should work, it just doesn’t. Any suggestions? I got the same problem. None of them mentioned here worked, so I deleted the app and re-installed. Then it worked. Please try. How do you get the time to display on that “widget screen” please? I only get the date/date. My “The Weather Channel” widget constantly says, “cannot get weather data”. All other widgets are working and I’ve checked all the privacy areas so that it should work, it just doesn’t. Any suggestions? Have you checked the location settings? Make sure location service is enabled for this one to work. Good Luck! The Timelock app i use for restricting the length of time my children are able to play on the ipad now allows them continue playing even when notification is there at the top. Before they had to press close and it would appear again within seconds and that stopped them continuing. My reminders don’t work. The time they are supposed to notify my passes then they go to overdue. I can’t believe this to be honest. Anything I have to do to solve this is ridiculous. They are reminders! Geez Apple. Losing respect. 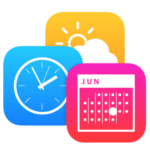 An update on the “up-next” widget: no toggling of any settings triggered the widget to show what’s next on my calendar, but I’ve determined the reason. This widget is only designed to show what’s next among non “all-day” events. So, understood: there are limitations with widgets and their capabilities. Although I’m certain, they’ll continue to improve. Reminders Widget does not work at all on my 6s running IOS 10. It did for a while, but now, no matter what I do it doesn’t work. I have tried every suggestion. My third party calendar app is still not loading. Anything else? My problem is I’ve never liked the News on my notifications. It’s set to “Off” on my phone; however, since the update, it shows in my notifications. I don’t want the news showing in my notifications! How do I stop it when everything is set to “Off”?! Also, I don’t care for the Siri Suggested Apps showing up either. I don’t want any App suggestions. I’ve tried all these tricks but my calendar widget still does not work. My weather widget works, but will not update. Only updates after opening weather app. If I check it in the morning, it will read 63 degrees. Later that day when temp rises 20 degrees, the widget will say it’s still 63. If I open weather app, then the widget will update. My WordPress widget no longer shows my site’s stats after updating to iOS 10.0.1. It used to show the stats before the update. Can anyone advise how to get the widget to work again? My watsapp widget doesn’t work. Tried all the work around! Scratch that. That didn’t change anything. **** Simple fix**** for me at least. Settings > Siri > last option at the bottom is “App support”. All the app widgets that were not working (WhatsApp, LinkedIn, Uber) were there and turned off. Turn them on. it can’t be that tricky to get a working agenda for a couple of events ahead!! For the Agenda – is it possible to select how many items it shows and not just the next coming item (I would like to have more under this widget). ?? I’d like to know how to change the location on the weather widget and remove old locations I’ve added. Also, before IOS 10 the widget screen showed the most recent contacts I’ve called or texted or the most popular. I’d like to get that feature back. Sandy, Tap on the WEATHER app on your home screen.Once you are in the weather app, tap on the bottom right hand corner. it will bring up all the locations you have set up in the weather app. You can choose to delete the locations by swiping from right -to-left or hit the + button to add new locations. Thanks. I put on the WhatsApp widget and it appears blank no matter what I tried..
Yuval, Have you tried to Reset your device yet? Press Home and Sleep/wake button together for 15 seconds till you see the Apple Logo and then let it start on its own. Check after that. You may also want to check your notification settings for WhatsApp. On my Up Next Widget its displaying an event I have in October. I have several things on my calendar beforehand. How do I get it actually list whats next and not a month from now? Thank you for this post – it solved my problem! My problem: Widgets were not refreshing. Reminders widget wouldn’t update/refresh – it was showing reminders that I had already deleted and NOT showing reminders that have just popped up. News widget was showing news stories from last night that were definitely not still current (articles, headlines, etc. had changed in the app but the widget was still showing the old version). Solution that worked: Changed language just as this post said I should. Settings > General > Language & Region > iPhone Language (changed from US English to Canadian English). Takes a moment to implement the change but as soon as I could get out of settings, the widgets had all updated. I changed it back to US English. I “tested” it several times by making changes to reminders and every time, it instantly updated the widget. So, it appears that this solution actually fixed the problem rather than simply causing one refresh.